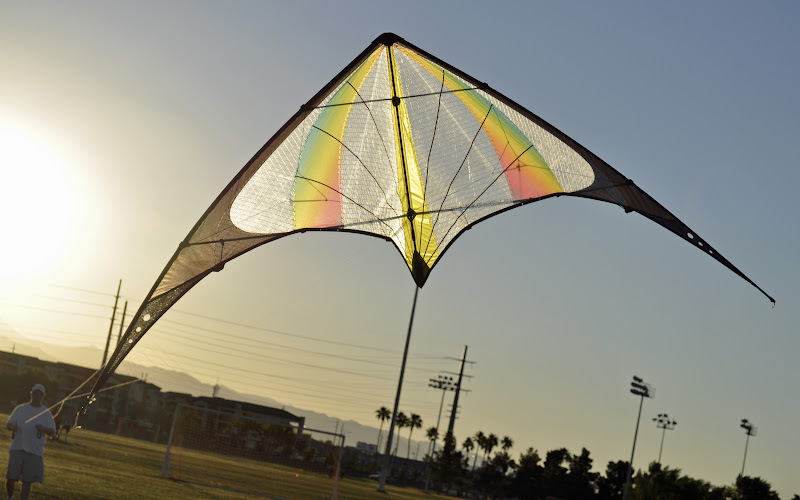 Had a brief chat with one of the excellent kitebuilders on the Forum. idea for a project kite. 1 Duplicate the Elixir in size, framing, weight. 2 New panel layout, just for variety. 4 Don't sell the kite. 5 At any rate, it would be a great "what if" sort of experiment. I'm open to panel layout suggestions or your thoughts on the subject. I thought the noodley leading edges were a feature. You guys should go for it. Sounds like a good project. Can you do the spectrum with the Mylar or the citrus(?) with black panels in place of the Mylar? 1 Duplicate the <insert kite name here> in size, framing, weight. So that's what a slippery slope looks like. Awwwww Mikey, give the kids something to talk about. Would you rather see another 2.2m N look-alike? I am so honored.... to have stood in that picture. Thank you John. The project sounds like fun. Hope Mark at Prism would support your idea. First changes: drop the Mylar and noodley leading edges. Awwwww Mikey, give the kids something to talk about. If you really want a new Elixir then either get Prism to make them, get Prism to make the plans available in some way or get Prism to give you their blessing. If Prism don't bite for any of these then simply banging out your own copy.... well, do I have to spell it out ? What is the world coming to that I'm the one defending Prism's IP ? Just to play devil's advocate... Are you talking about formal IP (copyright, trademark, patent), or an informal "not nice to potentially deprive a company of revenue" sort of thing? (or something else?) If the former, what specific IP is being infringed? If the latter, where is the loss of revenue occurring because of this specific project? I don't put much stock in slippery slope arguments -- I think you to draw the line somewhere, and allow someone to slide down the slippery slope until they cross it. But mostly I'm curious of other people's opinions because I think this thread raises some interesting questions. If the former, what specific IP is being infringed? I am going to go with designs used in commerce. If the latter, where is the loss of revenue occurring because of this specific project? Almost certainly nowhere. But that isn't relevant, legally or morally but especially legally. What is being discussed is copying a kite. Thus far the designer hasn't been asked to offer an opinion on the matter. The kite is difficult to come by for reasons. Would different reasons (ie; too expensive) lead to different excuses why it's OK to do ? It does. I am always saddened when a kite design dies and I'd much rather it be allowed to live on somehow but most kite makers/manufacturers just seem to consign them to the history books. I'd be delighted to see new Elixirs or RElixirs in the air but my delight does not mean anyone should just dive ahead and do it. A place for you "do it yourself''ers" to discuss your favorite techniques. Please note... GWTW does not support nor approve of the copying of existing kite designs. and it thus goes against the wishes of "The Forum", doesn't matter what arguments you want to make, it doesn't belong here. At least not until Mark Reed gives his permission for the experiment. Sure changing the panel layout and materials make the kite somewhat different, not selling it lessens the argument for deprivation of income except for the one kite and getting rid of the "Noodly" leading edges will totally change the character of the kite. Being the other half of that conversation, a long time prism kite flyer and a fan of the older prisms (just something about the way they fly) I like the idea. IT has been said on more than one occasion that the elixir was one kite that should have been looked at for an update. If take on this project it will be strictly a 1 off experiment not for sale. That being said, and out of respect for Mark and the original team I would talk to them before actually building one. Nothing wrong in dreaming up an idea and doing some concept drawings. Many new ideas and product improvements have started this way but MR Emery is right. IT would be the right thing to do to present the concept, once through planning, to Mark for his permission to proceed with a build of an exact copy(sail shape etc even with a different panel layout and framing). For the time being this is just and idea. I see nothing wrong with doing this as a personal project. There was nothing mentioned about the kite being produced and sold to others. It sounds like a personal challenge that will end up with a new 'Lix copy that cost $120+ in materials and $500+ in labor. When you could buy a used real deal Prism Elixir for the same cost as the materials... This isn't the same thing as the Chinese knock-off kites that are cheap copies of current designs that are made for profit. 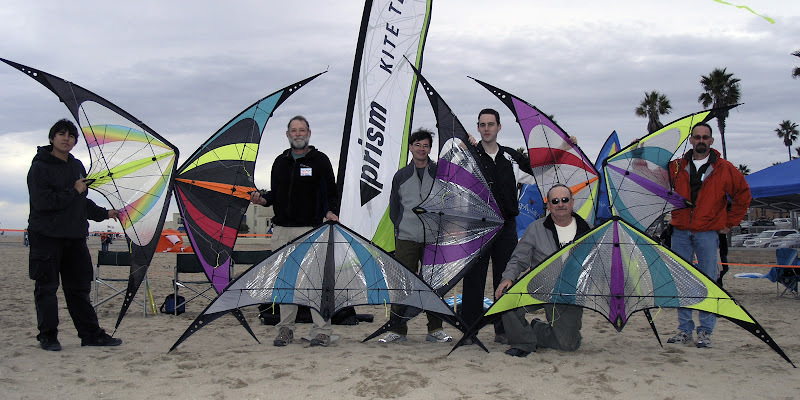 I think if Prism isn't going to produce its classic designs 'ever again', then maybe they should be released to a third party boutique maker (who might pay a vig to Prism), or to the public like the other designs that are available to individual kite makers. That might be a nice way for Prism to thank the kite community for putting them where they are today. I've always thought it would be interesting to see what could be done with the Elixir to modernize it, like the Gemini has evolved over it's lifespan.